Ernest Helton's Flyfishing Alaska ! Hi, I'm Ernie Helton, and I'm glad you've taken the time to visit my website. 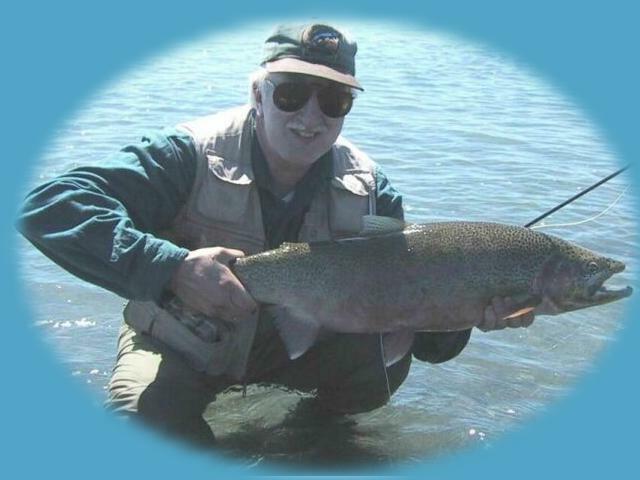 Let me tell you a little about myself and then we'll look at some of the pictures that were taken during several of my fishing adventures on the Kenai River. I live here in the great State of Alaska. My lifelong addiction is fly fishing. I have fond memories of fishing with my Dad in the Chatanika river outside of Fairbanks when I was ten years old. That was forty years ago. At that time the Chatanika was full of grayling, whitefish and even sheefish which are sometimes referred to as the tarpon of the north. I remember being amazed at the size of the sheefish when I would spot them holding in the Chatanika's deeper water. I'm not sure if sheefish even come into the Chatanika anymore. I now live in Anchorage in South-central Alaska. My favorite river to fish in this area is the Kenai. It is surrounded by some of the most spectacular scenery in the world and at times the fishing can be so incredible it borders on the ridiculous. The fish in the picture above is a nice rainbow trout I caught in June on the Kenai River. Each summer I try my best to get in enough days of fishing to make up for those long winter months that are a part of life when living in Alaska. On several occasions my wife Shellie is kind enough to let me go down to the Kenai Peninsula with my other fishing deprived friends and do the "male bonding thing" as she likes to call it. We'll let her think what she wants. There's very little time for any bonding. We're too busy fishing our brains out from sunup till sundown - whenever that is. Yes, it's a tough job rowing a drift boat and casting for trophy rainbows all day long but someone's got to do it. YEAH!!! I'll try to change out the photos as time permits. Check below for the latest ones. Got any good fishing stories or questions about fishing in Alaska? I'd love to hear from you. Drop me a line.